The B07 series has been discontinued. Please contact our Flow Engineering department. General purpose air filter/pressure regulators are designed for in-line use as a single regulating control filtering source for compressed air. These air regulator/filters are full flow ported for excellent flow and regulation characteristics for pneumatic equipment. They are availanle in ¼" PTF threads, a transparent bowl, relieving diaphragm, gauge, automatic or manual drain and a 0.3 to 8.6 bar (5 to 125 psig) pressure adjustment range. 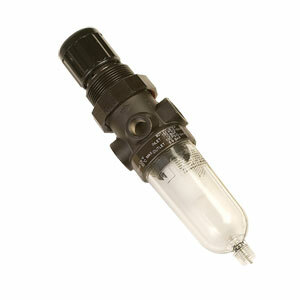 They are suitable for a wide range of pneumatic tools and components and an excellent point of use filter/regulator. These units can be panel mounted with a 30 mm (1.19") diameter mounting hole or can be used with the optional bracket and panel nut. Reducer bushings are also available to use with 1/8" NPT threads. Mocro-Fog lubricator, 0.5 scfm @ 90 psig, 1/4 NPT ports. Brass reducer bushing for 1/8 NPT connections, 1/4 NPT OD - 1/8 NPT ID, Qty 2 pcs.